We've all learned by now that people will continually let us down. Some people don't keep their promises, some don't show enough compassion for our troubles, and others just don't have the time to worry about the things that matter to us. But God is FOREVER faithful, and will NEVER let us down. He was there for His people in generations past, and His promises are still true today. He is the ONLY one who will NEVER leave us or forsake us. I praise God for His faithfulness to ALL generations; and I'm so grateful to know (without ANY doubt) that I can always count on Him to follow through on His promises. What a blessing! I've been a little bit discouraged in my crafting lately. I just feel like I'm in a bit of a "schlump" that I can't shake. I need to wrap my head around the reasons why I create.......like my love for crafting, and my love for giving hand-made gifts. I need to regain that joy in crafting that I once had. I'm really hoping that the next few weeks will bring about some of the joy I'm missing. Please don't misunderstand. I'm not depressed by any means. I am SO incredibly blessed. I just need to regain my "mojo" and my joy for crafting, and I'm praying that the events of the next few weeks will do just that for me. There are some exciting things happening, and I'm really hoping that will bring back the joy I've been missing. Cardabilities Sketch #129 - How fun! Thanks SO MUCH for stopping by today. It's always a blessing to have you stop by to say hello. Have a great week, and happy crafting my friends. Lovely card Karen, your collurs are gorgeous! I know what you mean about Design Teams ending up robbing you of the joy of creating, as you have deadlines and no real time just create what and how you would really like to,.as you feel a duty to use the company's images and materials. What a darling card, I LOVE those prints together. 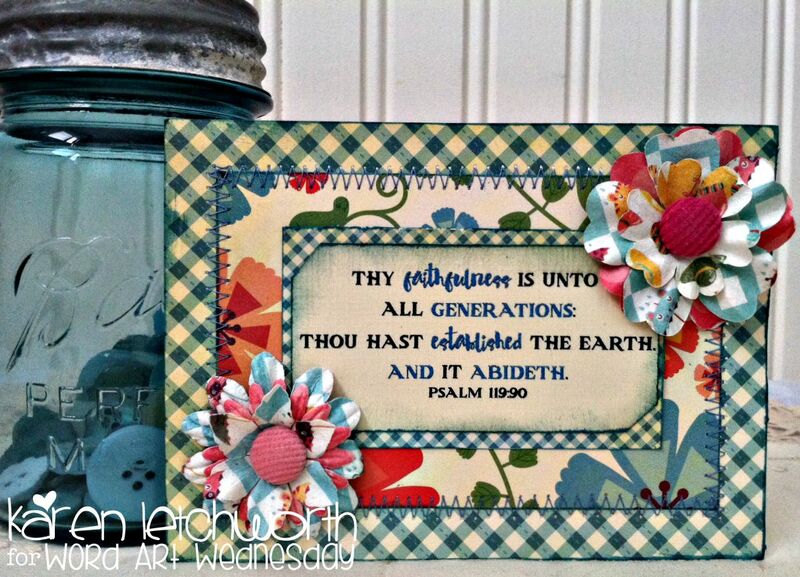 Sweet way to frame out the Scripture to keep it the focal point. You are doing a fabulous job, hang in there and bless the Lord even in the "valley" of creativity :-) (I know you are!!) I've been there and I know exactly what you are talking about. Karen, what a precious card. Your words were so inspiring and true. I have been looking for a new job and have been frustrated, but I am truly blessed with all that I have in my life. Thanks for your wonderful words. I love the happy colors of your DP's as well as the over-all design. Just to let you know that I completely understand how you feel and I m really amazed how you can juggle so many responsibilities with all the groups you are involved with. Truthfully, I am in and out of that same feeling. I find myself bypassing a lot of the images I have and I want to create with because I have to use certain images or materials. Not that I don't appreciate them but I have to stay true to the style and lay-out I'm comfortable with. There were a few times that I had to opt out of a Challenge just because I can't work with some designs or image concept/quality. Deadlines are also stressful although I must say that without it, I may be creating very few projects...LOL So, when I am completely uninspired and had to submit a project, I just rely upon the Lord to lead me and He faithfully delivers. Anyway, I'm praying for you to be relieved of some stress so that you can enjoy crafting like you used to. Living week to week on deadlines made me feel like I was creating just for the sake of the deadline. I'm not sure how some people do it long term! Some of my most admired crafters change around from time to time. It's OK! Pray about it and if you need to let something go -do it. Life is short and our joy of creating is our stress reliever! it's not our job. You are a fantastic designer and I always love seeing what you do! Hugs my friend. i'll be in prayer with you over your decision. Thank you for joining ODBD challenge this week! Your card is beautiful!! I love the colors and of course the scripture! Your sewing and papers are so fantastic! What a comforting verse and one we can all remember!! There is none other so faithful!! He is always there!! I just love your framing, Karen, your stitching and the different patterned paper. So vibrant!! Thanks for sharing us at ODBD!! I love seeing your creations. I hope you join us again soon. This is a very pretty card! 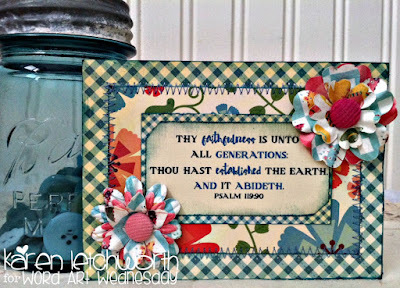 Thanks so much for joining us for the Anything Goes Challenge on the Simon Says Stamp Wednesday Challenge blog!